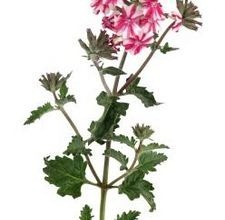 Zonal geraniums (Pelargonium x hortorum) are tender perennials hardy only in U.S. Department of Agriculture Zone 10 and Zone 11, but they are commonly grown as annuals throughout cooler regions. Their deep green foliage and colorful bloom clusters are showy in the garden and in planters on the porch or patio. Zonal geraniums have wide, rough-textured leaves that give off a strong scent when crushed. Blooms are produced on tall stems that tower above the foliage. They are available in numerous shades, including white, red, pink and coral. Many varieties have areas of color on their leaves similar to the bloom shade of the plant. Zonal geraniums grow from 1 to 3 feet tall and spread up to 3 feet wide. Blooms appear in late spring and persist until the first fall frost. A planting site in full sun to part shade is best, as growth and flowering slows in heavily shaded locations. A site with light shading is ideal in areas with extreme summer heat. Zonal geraniums thrive in average to rich soil that drains effectively. Select a lightweight potting media that holds moisture well if you’re growing zonal geraniums in a container. Constantly damp conditions should be avoided, as this encourages disease and root rot. Frequent watering is needed, especially during hot summer weather. Zonal geraniums planted in the garden require less frequent watering than those planted in a container. Water container plantings when the surface layer of soil feels dry. Garden plants need moisture only when the top inch of soil no longer feels moist. Apply moisture at ground level, as pooled water on the foliage may encourage disease. Feed once each month to promote healthy foliage and bright bloom color. Cutting flowers back after they fade keeps the plants attractive and encourages more blooms. Zonal geraniums can be moved to a protected location during the winter and replanted in the spring. They can be treated as houseplants during cold weather as long as they are provided with abundant sunshine. Water them just enough to keep the foliage from wilting, and don’t be dismayed when the blooms begin to drop; active growth will resume in the spring. The plants can also be kept in a dark, dry place with above-freezing temperatures until the spring. Zonal geraniums are used in many different ways. They do well in hanging baskets, planters and window boxes, as long as the moisture level of the soil is closely monitored. They are also attractive in borders and ornamental flowerbeds. The plants are eye-catching grown alone or intermingled with a variety of other foliage plants or flowers.